This gamma ray spectrometer map of the mid-latitude region of Mars is based on gamma-rays from the element potassium. 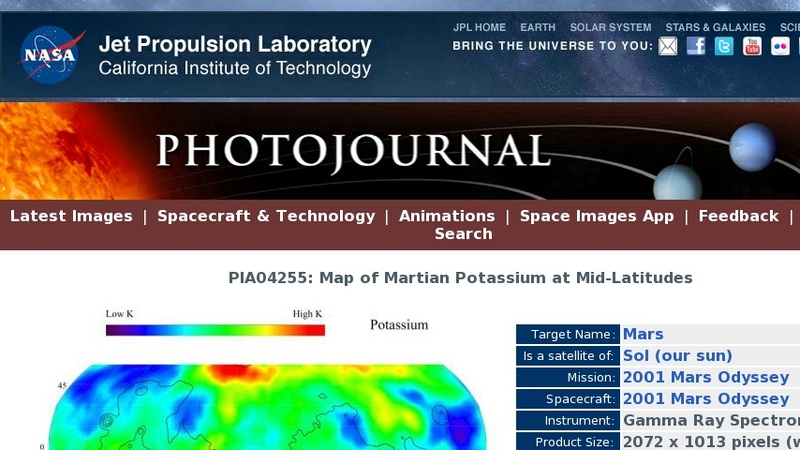 Potassium, having the chemical symbol K, is a naturally radioactive element and is a minor constituent of rocks on the surface of both Mars and Earth. The region of highest potassium content, shown in red, is concentrated in the northern part of Acidalia Planitia (centered near 55 degrees N, -30 degrees). Several areas of low potassium content, shown in blue, are distributed across the mid-latitudes, with two significant low concentrations, one associated with the Hellas Basin (centered near 35 degrees S, 70 degrees) and the other lying southeast of Elysium Mons (centered near 10 degrees N, 160 degrees). Contours of constant surface elevation are also shown. The long continuous line running from east to west marks the approximate separation of the younger lowlands in the north from the older highlands in the south. NASA's Jet Propulsion Laboratory manages the 2001 Mars Odyssey mission for NASA's Office of Space Science, Washington, D.C. The gamma ray spectrometer was provided by the University of Arizona, Tucson. Lockheed Martin Astronautics, Denver, is the prime contractor for the project, and developed and built the orbiter. Mission operations are conducted jointly from Lockheed Martin and from JPL, a division of the California Institute of Technology in Pasadena.